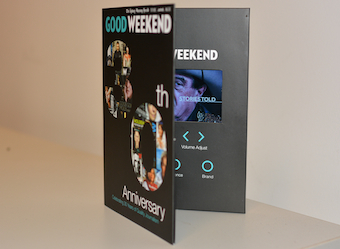 Fairfax Media’s Saturday insert Good Weekend magazine is celebrating its 30th anniversary with a trade campaign starting with an interactive direct mail piece with a built-in video player. Good Weekend will celebrate the anniversary with a special edition of the human interest colour magazine inside The Age and The Sydney Morning Herald on 27 September. Creative agency True Sydney had partnered with Fairfax Media for a month-long integrated print, digital, radio, direct marketing, event and public relations campaign. 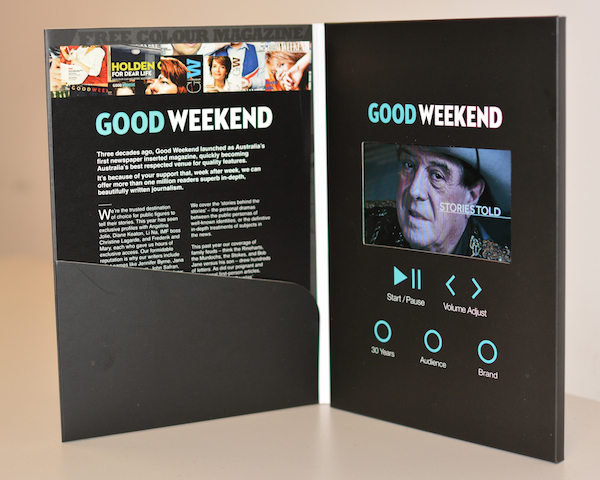 To kick off the campaign this week, advertisers, media agencies and media have received an interactive cardboard book that opens to a mini television screen and plays Good Weekend‘s three new videos, ‘30 Years’, ‘Audience’ and ‘Brand’. The campaign touts the tagline, ‘The whole of human life is here’, describing the way Good Weekend tells a wide variety of stories featuring humans at their centre. Visuals include covers from over the years, as well as images of personalities featured in the magazine. Fairfax Media commercial director Tom Armstrong said Good Weekend‘s highly engaged audience provided a premium, trusted environment for advertisers. Fairfax Media will also host a Good Weekend special event on 25 September for advertisers and media agencies. A panel of past and present editors will speak and musician Missy Higgins will perform. Here are the three videos: ‘30 Years’, ‘Audience’ and ‘Brand’.